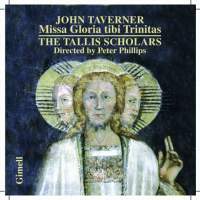 John Taverner (c.1490–1545) is one of the earliest Tudor composers, and this Mass, in the words of Peter Phillips, is “one of the greatest compositions ever to have been written in England.” The Mass has not been well served on records, the leading issues coming from Bruno Turner in 1962 (Schwann AMS 34), commendable for stylistic insight at such an early date; Andrew Parrott (Fanfare 9:6), a successful liturgical reconstruction marred by a few quibbles; and Stephen Darlington (31:1), whose choir of men and boys are direct successors of Taverner’s own Cardinal College choir, with the broadest tempos of any version. When Phillips recorded it the first time (9:6), his was one of the quickest versions of all. Harry Christophers (8:4; CD in 11:4), Richard Cheetham (23:3), and Paul Hillier (32:5) can be put aside for reasons originally given. All except Darlington use a small ensemble of one or two voices to a part. This Mass for six voices is based on a cantus firmus taken from a Trinity Sunday antiphon. Apart from its intrinsic worth, the Mass is fabled for one phrase in the Benedictus, “in nomine Domini.” This melodic fragment was transcribed for organ by Thomas Mulliner in 1560, soon becoming stock in trade for renaissance instrumental consorts in arrangements by numerous composers. Phillips has broadened his tempos in every movement since the first version over 25 years ago. While he supplied the composer’s “Leroy” Kyrie earlier, he foregoes any Kyrie this time, as Turner and Christophers once did in the first two versions. Phillips has filled out a very generous disc with the composer’s three Magnificats, making this the most interesting collection of the group (prescinding from Parrott’s reconstruction). An abridged version of the first of these Magnificats was the first Taverner work ever recorded, Guillaume de Van’s version in 1939. Several other versions of the work have appeared since then, including one from Harry Christophers (17:4), while the Magnificat for five voices is in a Taverner collection by Stephen Darlington (17:2) and the six-voice work came from John Poole on Coimbra CC 044 in 1975. The four voice setting has been recorded more often because the source needs no editing to make it performable, as the other two do. All three are alternatim settings with the polyphony in the even verses. Having all three to compare is a real advance for anyone who cares about the music. The variety of the three settings comes not just from the number of voices, for each is set in a different mode, or tone. The four voice setting is in the sixth tone, while the six voice setting is in the first tone; the five voice setting uses the faburden of the chant (an earlier practice which marks this as the earliest of the three), so it can only be guessed that it is in the eighth tone. Unfortunately, Phillips doesn’t mention this. This is the Tallis Scholars on their 40th anniversary. Their many admirers have never minded the piercing top voices that dominate the polyphonic texture. What they admire is the choice of repertoire and the exquisite interpretations that mark everything they attempt to do. After 40 years Phillips is still maintaining his high standard. Ad multos annos!